Who knew? My interest in the culinary world began with a VERY random subscription to Food and Wine magazine and the start of a dinner club. I found myself trying out random new restaurants and flipping through F&W realizing that I might actually be able to make some of their recipes. F&W is the one magazine subscription that I cannot do without. I have piles upon piles of old copies that I can't bear to get rid of because there are incredible recipes and wine lists in their pages. Food and Wine magazine is where I first read about Grant Achatz the genius behind Chicago's Alinea restaurant. Achatz is one of the most well known and respected chefs in the world but is also known for having developed stage 4 tongue cancer a couple years ago. His story of continuing his work and recovering is absolutely astonishing. His next restaurant venture slated to be opened in March is Next. 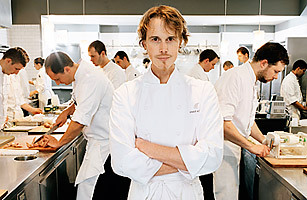 Achatz plans on completely revamping the menu every 3 months to focus on a specific place in the world during a specific place. For example, the first menu may be based on Paris 1912. There will be no reservations, instead tickets will be sold to the prix fix meal. I've already signed up to be notified when tickets become available. I know food isn't that exciting for most people, but there is nothing I'd rather do on a nice evening than enjoy an incredible meal with interesting company. You MUST check these out! NY Times article "The Perfect Menu. Now Change It"